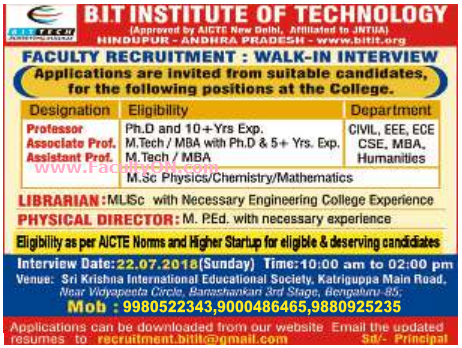 B.I.T Institute of Technology, Bangalore has advertised in the DECCAN HERALD newspaper for the recruitment of Professor / Associate Professor / Assistant Professor Plus Non-Faculty jobs vacancies. Interested and eligible job aspirants are requested to walk-in on 22nd July 2018. Check out further more details below. About College : B.I.T. Institute of Technology is established by Sri Venkateswara Educational Society under the leadership of Sri P. Chandra Mohan in the year 2001 at Hindupur and is approved by AICTE, Affiliated to JNTUA and Accredited by NBA. The college has a sprawling campus of 26 acres. BIT has spread its wings to offer Four Engineering disciplines, ECE, EEE, CSE and Civil with an intake of 330 seats, MBA with the intake of 60 seats and Diploma courses in ECE, CSE and EEE branches from the academic year 2009 with 60 seats in each course. How to Apply: Interested and eligible candidates are requested to attend the Walk-in interview along with CV, original certificates and recent colour PP size photos to the following walk-in address.